loved handmade: the first make of the season..
My first project of the season is off the hook and ready to wear! The perfect shade of grey too, so it'll be well worn over the coming winter months, I know. I absolutely loved making this cowl. It's big and chunky and quick to whip up, my most favourite kind of project. In fact, I could sit and make a mountain of these if I found the right place to purchase quality chunky wool from, and also if I had the time (sigh). If anyone has some suggestions or recommendations of suppliers, I'd love to hear. In the meantime, I'm working on a blanket for my biggest boys room, and an order has been placed by the little guy to have one for his room too, so these should keep me going for quite a while yet. 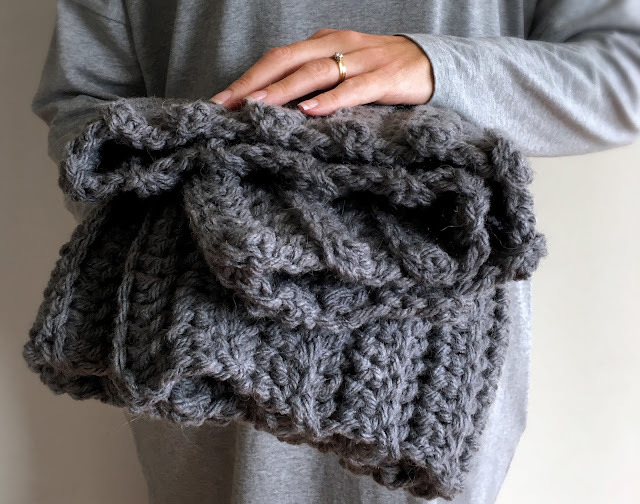 I'm constantly receiving emails and messages asking about this rib stitch (tutorial here), which has to be my go-to stitch for just about everything I make these days. I think its because it looks so much like knitting, and deep down I just want to be able to knit! I taught myself the basics years ago, but I think its about time I had another go. Plus, I keep being swept away in all the knitted beauty that fills my Instagram feed and I just want to dive right on in there. I'll keep you posted!